Get ordained today, Officiate a Marriage tomorrow! With the credentials you receive from our incorporated non-profit Church and Seminary you may set up your own spiritual counseling or healing practice or start your own ministry, church or wedding chapel. Feel good about what you do. Make a living doing what you were born to do, what you love to do. A recent study listed ordained ministers and all clergy as one of the top 10 recession-proof careers. In fact, during economic hard times, an ordained minister gets more work. People are turning to clergy now more than ever. Non-denominational, alternative ministers are in high demand. Articles describe growing job opportunities for spiritual & metaphysical practitioners. The corporate world is realizing its need for ministers and clergy of ALL spiritual traditions. Dr. Lauri the “Dream Interpretation Lady” appeared on CNN with Sanjay Gupta. Watch the video here. Dr. Lauri received her Doctor of Divinity degree from the Seminary and later used her minister ordination to perform her sister’s wedding in Tennessee. Dr. Lauri has made several TV appearances: Dr. Oz, ABC’s The View, CNN with Anderson Cooper 360, The Today Show, and Good Morning America (ABC), pictured right. The Interfaith Minister is our most popular title. The Interfaith Minister is often called upon to heal gaps between the many disparate religious faiths. This title is a good choice if you plan to officiate weddings, work in prison or hospital ministry and be active in your community. To be ordained as an Interfaith minister means you recognize all positive spiritual paths regardless of denomination, including healing and earth-based traditions, and make no judgments against other valid spiritual faiths. It is also an excellent choice if you consider yourself a multi-faith minister. The Esoteric Minister serves humanity by studying and expounding the inner core of the world’s religions and spiritual wisdom traditions. S/he ministers to the esoteric and alternative communities — other souls turning within for spirituality instead of to mainstream. The word esoteric is Greek and means “inner”, denoting inner gnosis, wisdom, and knowledge pursued only by the “chosen few.” All Esoteric Minister candidates should consider ordering the book, Inner Christianity: A Guide to the Esoteric Tradition, as described in our tenets of faith page, and take the mini-course based on the book. Spiritual Minister is a good title for mystics — people who attempt to directly connect with the Divine on some level. If you recognize that spirit is just as important in every human’s life as mind and body, and if you want to minister to folks to correct that imbalance, this is the title for you. This title is also somewhat “generic” and therefore versatile and can be used by any minister. The four titles above are the most popular, but we allow you to design your own. Here are a few of the other minister titles we’ve ordained over the years: Healing Touch Minister, Youth Minister,Ordained Rabbi, Gnostic Minister, Priest, Shaman, Reiki Healer, Ordained Celtic Druid Minister, Teutonic Chaplain, Interfaith Chaplain, Pastoral Counseling Minister, etc. Don’t hesitate to design your own ministerial title. As long as it’s positive and the intent is to help humanity, it is acceptable. You may also combine titles such as Spiritual-Interfaith Minister or Esoteric-Spiritual, Psychic-Interfaith, Interfaith-Mystic etc. All of these clergy titles enable you to legally perform weddings, funerals, baptisms, Mass (give Communion), and offer pastoral counseling, including intuitive readings. You may legally attach Reverend, Pastor, Chaplain, etc. to your name, and accept money for your services. You will also have the option of filing your taxes as a clergy-member and applying for tax-exempt status with IRS. You can even start your own church and order a legal Church Charter founding document from us. You name the church whatever you choose to suit your specific ministry. If you want more than one title, you may choose additional separate certificates of ordination when you place your order online for a minimal paperwork fee (only twenty dollars extra). You will be able to order them when filling out your application. Holy Orders to the Priesthood are available for both men and women, but study is required and the program is much more costly than the ministerial ordinations above. Priestly Orders are administered by a Bishop of the Esoteric Rite with Apostolic Succession. 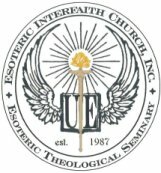 The Esoteric Interfaith Theological Seminary is the educational institution of the Esoteric Interfaith Church, Inc., a non-profit non-denominational church with IRS 501c3 tax exempt status that accepts, acknowledges and respects all faiths of the world that are dedicated to the service of the Divine. Our Ministers and Rabbis come from all walks of life and educational backgrounds. Many start their own branches of the E.I.C., or start their own totally independent churches. The Minister may serve a congregation or have a pastoral counseling practice. His or her emphasis may be on teaching or healing or on performing the sacraments and religious ceremonies.Our Ordinations are legal in all 50 States, and never expire. We charge no annual renewal fees. Most online ordinations sites ordain you online without screening, without collecting written work from the minister candidate. You never know if an ordination from them which you print out yourself online(!) is going to have its validity questioned when you go to officiate a wedding. ULC ministers cannot officiate weddings in dozens of States and cities such as NYC, but our ministers legally officiate marriages in all 50 states and all cities and have been doing so since 1987. Our by-laws specifically allow the Church to ordain ministers as the need arises, as we have screened them, trained them, seen their work and judged their spiritual commitment. Step 3: Submit completed application and $150 one-time tuition fee (you will be sent to the payment page automatically after you complete the application). Minister tuition is $150. This is a one-time only cost. We accept Paypal, major credit cards and money orders. Personal checks are accepted but take 10 extra days to clear. The $150 tuition fee covers the record keeping (we must keep a permanent file on each minister to document and validate your credentials) legal certificate with beautiful gold raised seal. We also provide a lifetime reference service for our Ministers / Practitioners and Alumni. Any time you need a reference—occupational, credit or personal—-you may use one of our officers or our organization (or both). We also verify your credentials to Keen.com if you have (or want to start) an online counseling practice with them, thus enabling you to make more money doing what you love — helping and guiding others on the spiritual path. Practitioner’s Directory You are also entitled to place your entry in our online Practitioner’s Directory for free. This gets your ministry, church and/or spiritual healing/counseling practice some needed exposure. It was created years before Facebook… (smile) but it still gets a lot of hits! Please keep in mind that we are a legally incorporated non-profit religious organization. We are not here to make money, which is why our fees are so low. In fact we’ve never raised the $150 donation for ordination since we started in 1987. The Seminary does not do online ordination, but distance ordination. Other organizations offering online ordinations “for free” or a very minimal fee make you print your own credentials on your own printer. No one signs the Certificate of Ordination, nor embosses it with a raised seal like we do. A courthouse official or City Clerk may think such a self-printed Certificate of Ordination looks shoddy and will not allow you to register to officiate marriages. You will have trouble getting legitimate recognition for your ministry, getting tax exempt status, as you can with us in all 50 States. Marriages you perform may be called into question at a later date, even years down the road. If you ever go to the Courthouse to prove you are a minister (such as before performing a wedding), or if you someday start your own church or apply to the IRS to get tax exempt status, you want to show them a bonafide Ordination Certificate with a raised seal, signed by a live person. Our Certificates of Ordination are signed in person by a real human being, not printed out on your own printer. They are printed on special certificate paper, not plain printer paper! Our Minister Ordinations are recognized in all 50 States and many countries around the globe. Our ministers officiate marriages and legally provide pastoral counseling, readings, healings, etc. all over the world. Our seminary backs you up with verification and letters of good standing, letters of reference, even help completing a marriage license — or whatever you need. Unlike other online ordinations we CHARGE NO ANNUAL RENEWAL FEES. Your ordination from us is NOT temporary, and it NEVER EXPIRES (as do most others). We offer laminated wallet cards which contain your credentials. For $15 we make you a Minister or Rabbi Photo badge, good for use in Prison Ministry and Hospital Ministry. (Please email your photo to the Seminary or snail mail a passport photo). Read this inspiring adaptation of Isaiah 61, the Universal Ministry as you answer the Call to ordination.